Retired U.S. Army Sergeant Mario Lopez is a Wounded Warrior and talented artist whose eclectic and colorful landscapes, abstract objects, stylized designs and photographs have been featured in art shows around the country. Motivated by the September 11, 2001 attacks, Lopez left his home in Alice, Texas, joined the Army in 2003 and was deployed to both Iraq and Afghanistan. 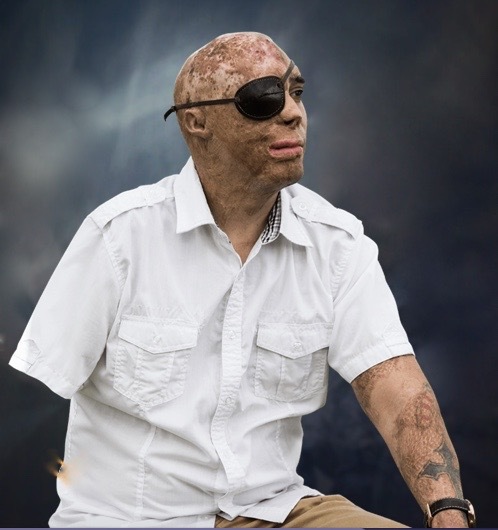 During a mission in 2008, he was seriously injured when an Improvised Explosive Device, or IED, detonated. He sustained burns over 54% of his body, and lost his right arm, vision in his right eye, and four fingers on his left hand. During his recovery at the San Antonio Military Medical Center, Mario, who was awarded the Purple Heart, turned to painting as part of his healing. Mario’s work is featured in numerous venues and art shows around the country – Long Island, NY, Corpus Christi, TX, San Antonio, TX, Bandera, TX, Dallas/Fort Worth, TX, and Kimballton, IA. Mario’s work was also presented in part with the New Century Art Guild at the Joslyn Art Museum in Omaha, Nebraska.